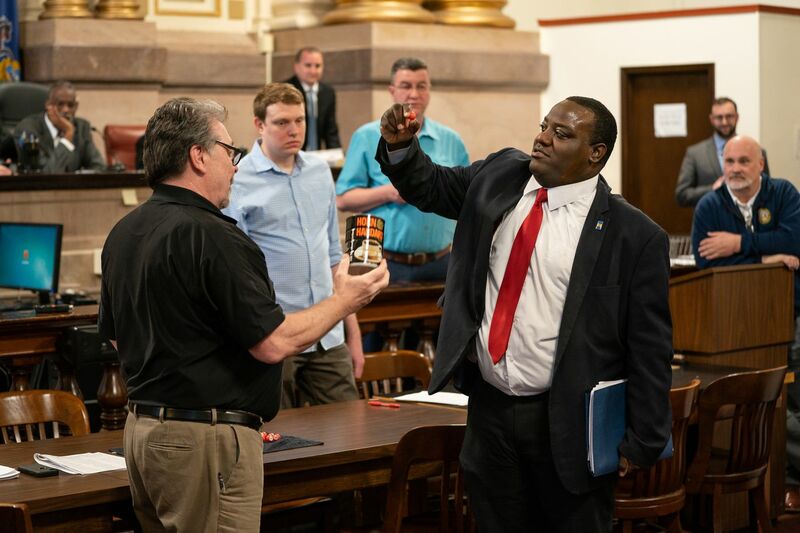 Devon Cade (right) draws for ballot position out of a coffee can held by Kevin Kelly, acting supervisor of slections, in City Hall on Wednesday. Devon Cade says he doesn’t understand why so many of the politicians who gathered in a City Hall courtroom Wednesday were so angry at him. Wait 'til he meets their lawyers on Friday. Cade, a Democratic candidate for City Council at large, on Tuesday filed legal challenges against 30 of the 33 other Democrats running at large in the May 21 primary. Three Common Pleas Court judges will start hearings for those and other cases Friday. Some may take weeks. Some may feel the swift kick of justice. Cade, who used to work for the Department of Licenses and Inspections and now lists his occupation as “philanthropist,” claims he used artificial intelligence software to analyze handwriting on nomination petitions to detect forgeries. That formed the basis of his unusual mega-challenge, 30 identical legal documents, filed against everyone in the primary except Councilwoman Helen Gym and candidates Sherrie Cohen and Wayne Allen. All the candidates gathered Wednesday to draw ballot positions. Cade pulled the 24th spot. It’s all fun and games until a judge decides to hold someone accountable. There is precedent for hitting a challenger with hefty financial sanctions if the legal case is too flimsy. Cade said he was not worried. One of the at-large candidates Cade challenged, David Conroy, dropped out Wednesday. But Conroy said that had nothing to do with Cade’s challenge. Conroy is a candidate for Municipal Court and pulled the first ballot position this week for that post. Allan Domb (right) draws for ballot position out of the coffee can in City Hall on Wednesday. Kevin Kelly, acting supervisor of elections, holds the can. City Councilman Allan Domb, an at-large Democrat seeking a second term, appears to be inching closer toward triggering the “millionaire’s provision” in the city’s campaign finance law. Domb spent $36,776 to air campaign commercials on broadcast and cable television this week, plus $9,585 on radio ads. As we told you two weeks ago, Domb sunk $275,000 into television commercials for the first week of this month. That’s remarkably heavy advertising spending this early in a Council race. Domb, a millionaire real estate broker, spent just under $1 million of his own money to win his first run for Council in 2015. Former State Rep. Nick Miccarelli of Ridley Park. Former State Rep. Nick Miccarelli, who last made news when sexual harassment allegations sank his political career, has a new job. Miccarelli was appointed this week to head Community Transit, a nonprofit that mostly shuttles seniors around Delaware County. He got the job after the board interviewed him along with “five or six candidates,” Chairman Nate Much told the Delaware County Daily Times. “He brings a fresh perspective, and we felt comfortable he was going to do the job. That’s all there is to it,” Much said in an interview with that newspaper. Miccarelli told Clout he’s “looking forward to doing the job,” but declined to say how much it pays. Miccarelli was accused by two former girlfriends of physical or sexual abuse. One of the women, State Rep. Tarah Toohil, said he kicked her and threatened to kill himself and her with a gun when they dated in 2012. The second woman, a GOP political consultant, said Miccarelli sexually assaulted her after their relationship ended in 2014. Miccarelli denies the allegations and was never charged, but an internal state House investigation found the claims to be credible, prompting the House to impose restrictions on him, and Gov. Tom Wolf and GOP House leaders to call for his resignation. Members of the social justice group Indivisible Swarthmore protested the appointment Wednesday at the County Council meeting. Delaware County has a $5.7 million contract with Community Transit, good through July. Rachel Pastan, a member of the group, urged the council to not renew the contract as long as Miccarelli was executive director. She called the job an “appalling” political appointment. “Given his history of making women feel unsafe, Mr. Miccarelli seems like a singularly inappropriate choice for this job,” Pastan said in a statement.